Roasted potatoes are one of the easiest side dishes to make and they go with just about any meal. I really love my Baked Potato Wedges that are tossed with garlic powder, paprika and Parmesan cheese, but I always make them so I wanted to come up with a new flavor profile. 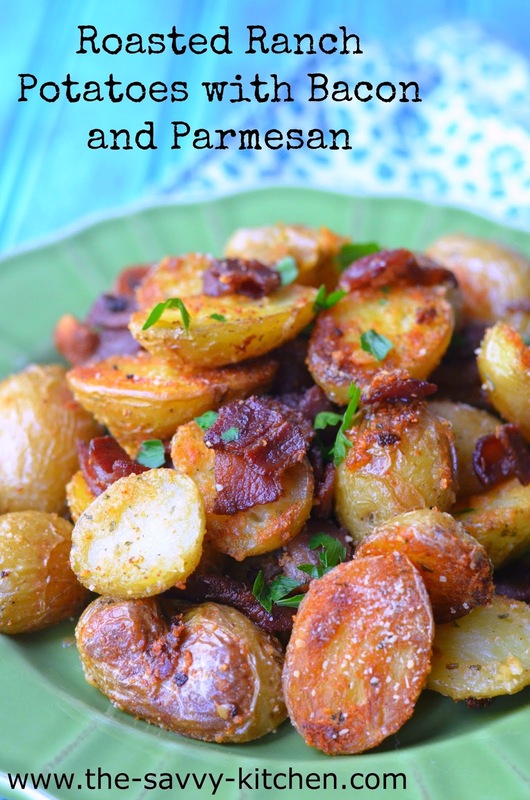 These roasted potatoes are just as simple, but lots of extra delicious flavor is added from bacon (of course) and Ranch seasoning. Yum. I decided to parboil the potatoes to lessen the baking time, but if you have some time to kill you can just toss them in the oven and skip the boiling part altogether. Either way the potatoes become nice and crispy in the oven. 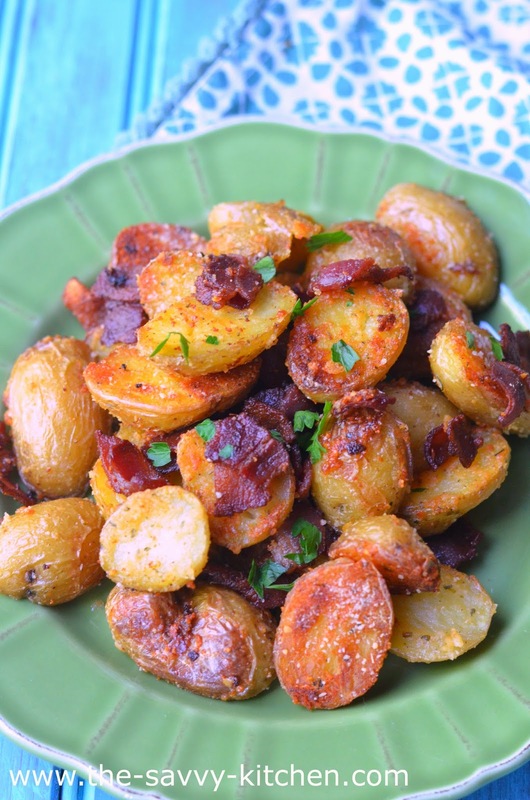 The combination of the browned potatoes, the crispy bacon and the Ranch seasoning makes an excellent side dish for all of your BBQs this summer. Enjoy! 1/4 cup Parmesan cheese, grated, plus 2 tbsp. Add potatoes to a pot and cover with one inch of water. Bring water to a boil, and boil potatoes for 15-20 minutes or until fork tender. Drain and allow to cool. Cut in half and set aside. Cut bacon into bite-size pieces. Cook bacon in a large skillet until crispy. Remove from skillet and drain on a paper towel-lined dish. Reserve 2 tbsp. bacon grease. Combine oil, 2 tbsp. bacon grease, 1/4 cup cheese, garlic and Ranch seasoning mix. Add potatoes to the mixture and stir to combine. Spread the potatoes in an even layer on a baking sheet. Bake for 25 minutes. 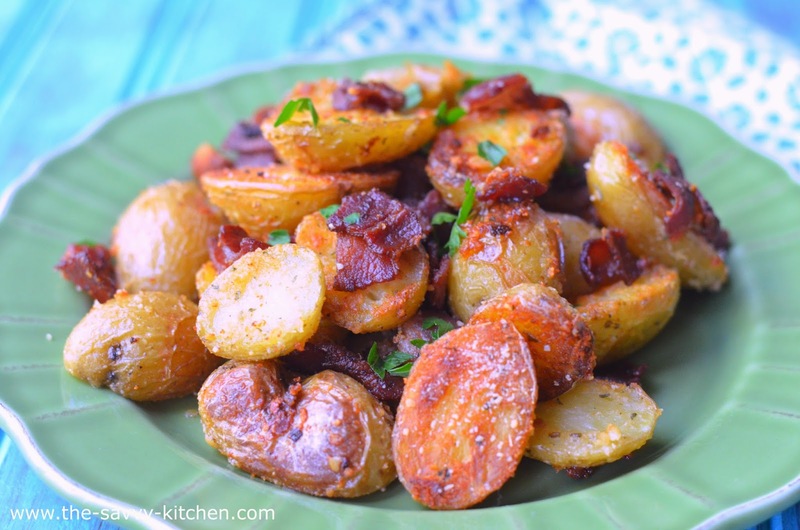 Flip potatoes over, sprinkle with bacon and additional 2 tbsp. Parmesan cheese. Bake for an additional 20 minutes or until golden brown. Amy.... roasted potatoes are one of the best things on the planet. I love them and the fact that you paired them with bacon and parmesan cheese makes YOU one of the best things on the planet. They look phenomenal.